In May, I was in Orlando for Canon’s Dealer Summit. Breaking with tradition, Canon hosted top-tier dealers alongside a few select media and industry analysts. The company didn’t make any bombshell announcements, but instead briefed us on where they are headed. Canon fielded a lineup of their top executives for the event. Nancy Langdale, Canon BISG’s VP of sales welcomed the attendees before introducing Yoroku Adachi. The CEO of Canon Americas Group discussed Canon’s finances, noting Q1 increases in net sales (4 percent) and operating profit (11 percent). We also heard from Toyo Kuwamura, former EVP at Canon USA, who told the crowd that dealer channel hardware sales growth was up 5 percent year over year. Shortly after the summit, in early June, Canon announced that Kuwamura has retired and returned to Japan and is replaced in the U.S. by Shinichi Yoshida, who most recently served as executive vice president/GM at Canon Canada. [Editor’s note: We will very much miss Kuwamura’s dynamic presence, but look forward to new influences that Yoshida will bring to the team]. Senior VP Mason Olds was up next and spoke about the company’s sales strategy for growth and highlighted some recent research that places Canon No. 1 in OEM trust amongst office equipment dealers in the BPO Research Performance Radar. It’s part of BPO Media & Research’s annual tracker on dealer sentiment. If you are reading this and are a dealer, your chance to weigh in for the year is coming up and we would really appreciate your support by taking the time to fill out the survey. Next up was Deputy Chief Executive Yoshinori Ikeda with the lineup of Canon’s digital solutions, and Hiro Imamura, senior vice president and general manager at Canon USA, on the state of office hardware. We also heard from other international Canon and Océ executives and received briefings from Canon partners NT-Ware, Box and mxHero and Nuance e-Copy. The Large Format Strategy segment by Rob Reddy, senior VP at CSA and Nobu Kitajima, VP and GM of Canon BISG, sparked my interest. The pair highlighted Canon’s share of the large format marketplace, the trends they are seeing, and how large format devices can help dealers enhance their businesses. After all, in the end, it’s all about making money. Speaking of the CAD market, Canon is cleaning up there, too. Canon Océ devices are No. 1 in the CAD market according to Kitajima, who predicts that they will remain strong in this area. Kitajima also mentioned growth in Canon’s Arizona flatbed venture. “It’s a very busy area and we have a lot of competitors here.” Although Canon isn’t No. 1 in this venture (Kitajima didn’t mention where they fall on that spectrum), they saw a 5 percent increase in their share of the market last year. “We are still growing again this year,” he added. Kitajima handed the reins to Reddy, who pivoted the discussion toward large format trends. “When we take a look at trends within the large format space, there’s really three markets we look at: CAD aqueous inkjet, CAD productive and graphic arts,” said Reddy. “Within the CAD aqueous inkjet, we see a nice healthy growing marketplace, with more placements year over year” said Reddy. MFPs are also growing in this area, which according to Reddy is the result of two factors: products like the imagePROGRAF are just that good, and shrinking print volumes on the productive side of the house that make Aqueous solutions more viable for customers. Looking at CAD productive, reasonably priced high-speed color-enabled devices have really pushed the needle over the past two years. And although monochrome is “extremely strong” within this marketplace, high-volume monochrome continues to decline. But there is a silver lining — it opens the door for dealers to place more low- to mid-volume devices in this space. “Within the graphics arts markets, we just see growth, growth, growth,” said Reddy. He credited the aqueous’s increased media options with providing more flexible print options, which will drive volumes up. This uptick, he believes, will pull a lot of printer sales, be it roll-to-roll or flatbed models. According to Reddy, there are a lot more flatbed devices in the field than there were 10 years ago, even though most volume is still coming from roll-to-roll devices. But given that flatbed models are a fairly new technology, speculation that it will one day eclipse its roll-to-roll counterparts in both placements and volume has to occur. The pair rounded out their presentation by making their case for how dealers can enhance their business with Canon’s large format portfolio. For one, they can be the differentiator you need to stand out from competitors. In addition, dealers can use large format to get their foot in the door at tough-to-crack accounts. “Large format devices can be fantastic tools to get into competitive accounts, because that gatekeeper that’s been keeping you out to trim their fleet for years isn’t the person you talk to for wide format,” said Kitajima. Finally, large format devices can be a great way to expand your presence in existing accounts, as well as ward off competitors from poaching or straight up muscling you out of existing accounts. Overall, the future looks good for large format. Reddy shared the results of a survey, in which 69 percent of respondents said they believe their print volumes will increase, and that 57 percent of all their print volume were large format. Growing demand aside, having a large format strategy can get your business into accounts that are otherwise tough to get into, and help you expand your existing accounts and/or protect them from competitors. Large format is not for the faint of heart, however. It requires solid investment, training and support. It’s definitely an opportunity for a sub-section of the office equipment dealer community. If you need to make a move on something, this is worth a hard look. 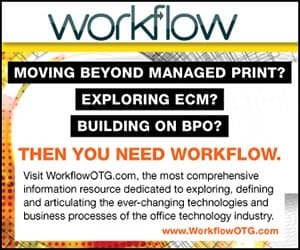 Patricia Ames is senior analyst for BPO Media, which publishes The Imaging Channel and Workflow magazines. As a market analyst and industry consultant, Ames has worked for prominent consulting firms including KPMG and has more than 10 years experience in the imaging industry covering technology and business sectors. Ames has lived and worked in the United States, Southeast Asia and Europe and enjoys being a part of a global industry and community. Looking Back at the MSP/MPS Connection — Where Have We Been and Where Are We Headed?